The current machinery fleet takes care of all the farming operations as well as being able to take on additional work should the opportunity arise. Along with purely agricultural operations, MJ & SC Collins can undertake a range of ground works using both wheeled and 360 diggers along with a vast knowledge of groundworks and construction. All machines are fitted with Trimble RTK guidance systems which not only bring the benefits of reduced operating costs but enable the business to engage with Controlled Traffic Farming to reduce our footprint on the ground but also to speed up timeliness to ensure we give our crops the best possible chance to perform. MJ & SC Collins operates a high output sprayer which can apply both agrochemicals and liquid fertiliser at 24m and 36m working widths. RTK guidance ensures tramlines can be put in exactly the right place year in year out. Variable track width means that our sprayer can fit down any tramline. 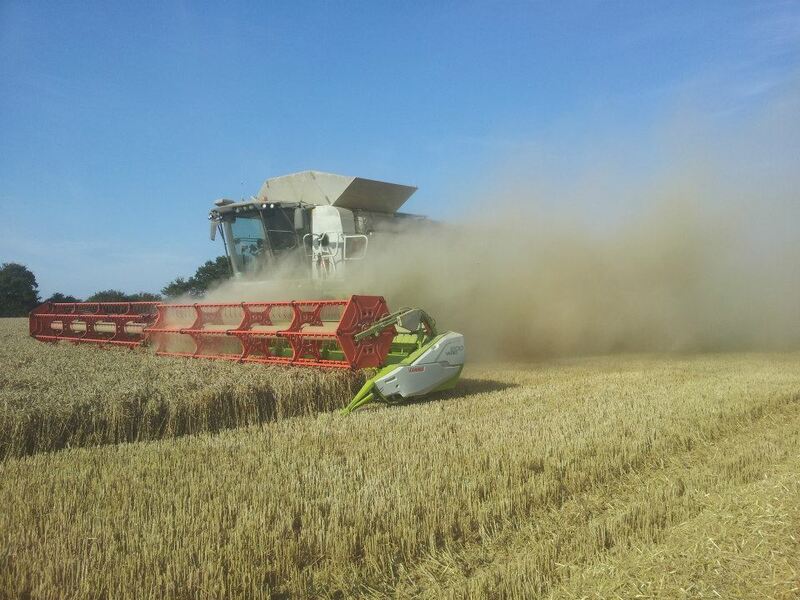 The capacity of the Lexion 770 combine on tracks coupled with the 12.3m cutter bar means that we can achieve work rates in excess of 60ha per day. This gives us the ability to either wait for conditions to be that little bit drier or harvest large tonnages of crop before quality deteriorates or the weather breaks. Please Contact John Haynes in the office for further information or to discuss details of required work. MJ & SC Collins uses both min-till techniques alongside targeted, rotational ploughing methods to ensure that the soil is managed correctly to suit the cropping and conditions. 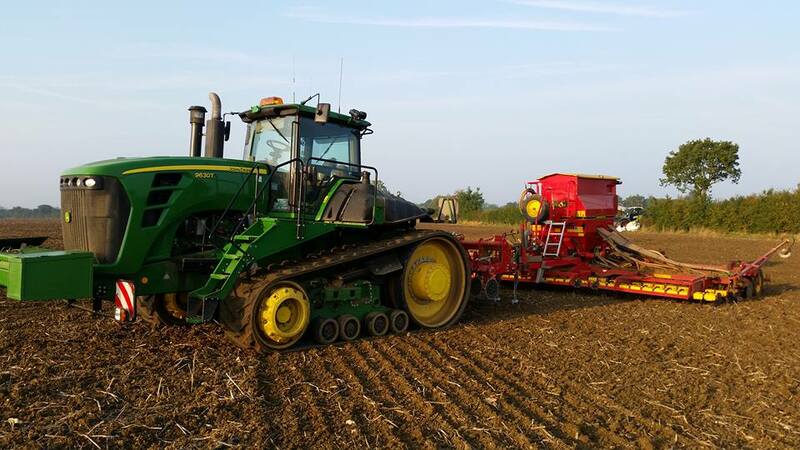 Various drills mean that drilling dates can be flexible to suit soil conditions. Mole Draining – twin and single leg. Subsoiling using 4m & 6m subsoilers. Min till cultivations using the very versatile 7m Vaderstad Topdown. Ploughing using 6 & 12 Furrow Lemken ploughs. Pressing using 6m Vaderstad Rexius Twin Press. 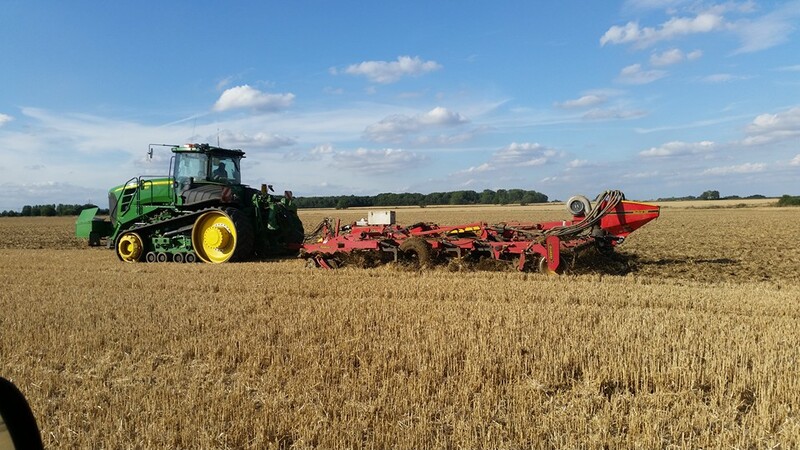 Grain and Pulse drilling using Vaderstad Rapide 8m drill, Horsch Sprinter 8m drill and Keverneland 6m tine drill. Using either of our diggers we can carry out road side and in field ditching to regularly clean ditches or completely revamp old ditches which have not been cleaned for years. Spoil is levelled out to ensure it can be dealt with in the following crop and outlets can be replaced or repaired accordingly. Having 300ha of un-drained airfield at Lysander Park that was hindering agricultural production we undertook to carry out our own land drainage in order to improve the soil structure and yield. Machinery was purchased and we undertake approximately 60ha per year working in the growing crop between rounds of fertiliser. Fields are surveyed using GPS and then we create our own scheme which is then installed using the trencher and Trimble GPS. Part or full schemes can be created to suit individual needs and can be installed during the spring or early autumn. Our own gravel cart ensures that stone is put in the trenches at the right level for optimum mole drainage. John Deere 9630T – This is the prime mover of the business which carries out all the primary cultivations and drilling. Implements include twin leg mole drainer, 7m Vaderstad Topdown, 12 furrow Lemken plough and 8m Vaderstad drill. Due to the workload the 9630T operates 24 hours a day during peak periods. 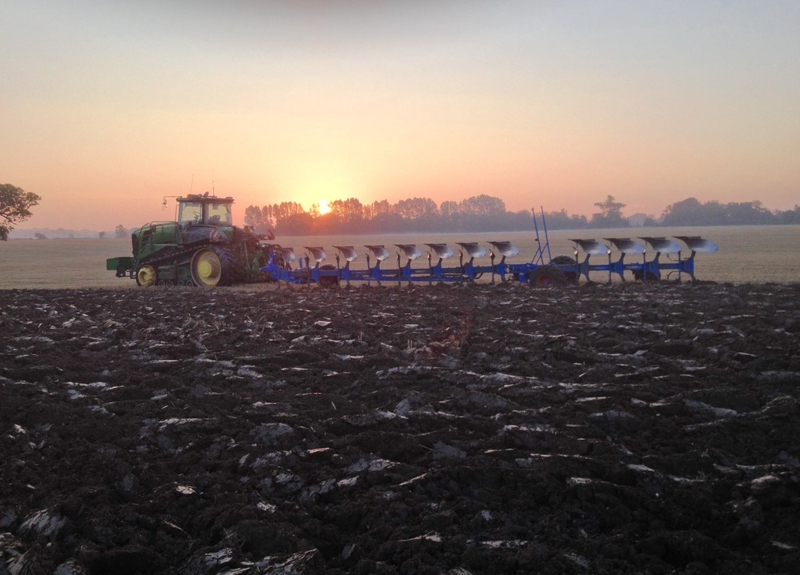 John Deere 6215 – Despite not being the biggest tractor on the farm, the 6215 racks up the most hours in the year. The 6215 uses the step-less transmission to operate the trenching machine throughout the spring in between rounds of fertiliser application. During the summer the 6215 is kept busy by chasing the Claas Lexion 770, along with a second similar sized tractor, they are responsible for carting the 8,000 tonnes of combinable crops from field to farm. 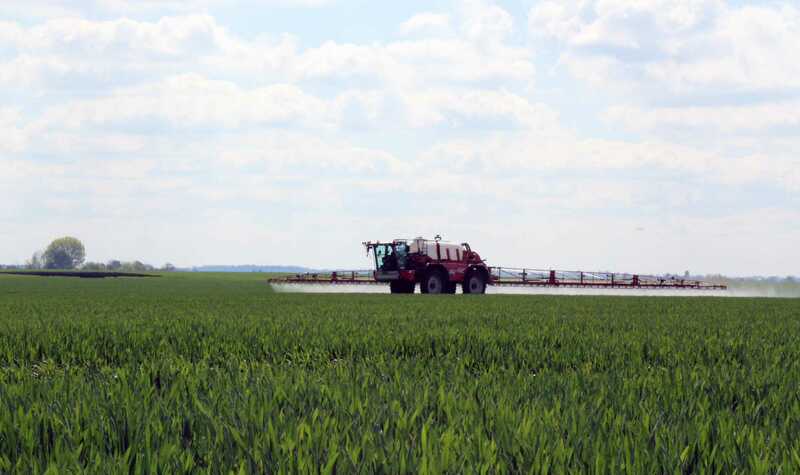 Agrifac Condor Endurance – The 8000L tank and speed on the road has increased the farm’s spraying output by 20%. A perfectly balanced chassis and large tyres means that the sprayer’s footprint is as minimal as possible at sensitive times of the year. It is essential to have a reliable machine that can be called upon at any day of the year to apply the agrochemicals at exactly the right time. This ensures maximum efficacy of the chemicals to maintain anti-resistance strategies and to prolong the life of the active ingredients themselves. 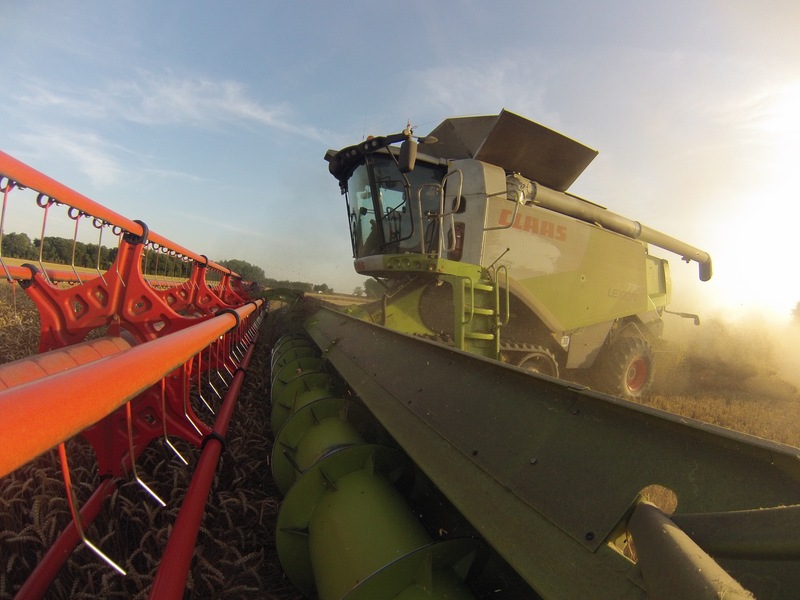 Claas Lexion 770tt – Fitted with a 12.3m cutter bar, the combine has huge output which enables the business to harvest large areas in better conditions instead of being forced to harvest when conditions aren’t quite right. 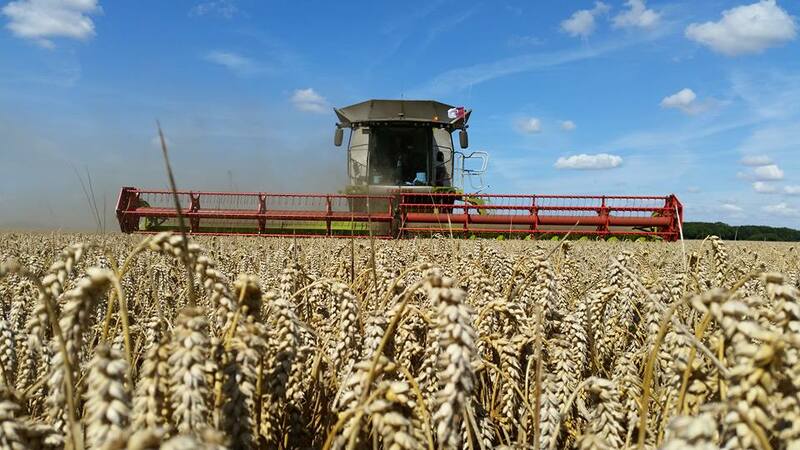 Also fitted with Trimble RTK guidance and yield mapping, the combine keeps to the farm’s 12m traffic lanes whilst gathering yield data which is used to analyse every acre of the farm and also helps the Farm Manager fine tune seed & fertiliser inputs. Diggers - The farm operates 2 diggers – a wheeled digger and a tracked, 18T machine. Both these machines are kept busy throughout the year on various jobs which include loading the gravel cart, digging drain junctions, ground works and ditching. John Deere 6210R – The 6210R is a very versatile tractor in our business and carries out a range of duties during the year. During the spring the 6210R backs up the fertiliser spreader by carting bulk fertiliser from the farm’s central store to the blocks where the fertiliser is being spread. When we are trenching the tractor is kept busy on the gravel cart back filling behind the trencher. During the summer the 6210 R carries out all the hedge cutting, helps with the ploughing, carries out rolling and pressing. Claas Scorpion 9055 – Ever since the construction of the farm’s 5000t grain store at Lysander Park, the farm has needed a machine that can push grain up to heights in excess of 4.5m. With this height capacity comes an unmatched carrying capacity which gives the business the ability to not only take full advantage of the grain store capacity but unloading the grain stores can be done extremely rapidly using the 4T bucket. John joined the business in 2011 after working as a Farm Manager for Velcourt on the Suffolk Coast. Originally from North Yorkshire, John has spent his career since graduating from Wirttle College in East Anglia where he first joined the Co-Operative Farms’ management trainee scheme. John is BASIS & FACTS qualified and is responsible for all aspects of the farming side of the business. John is always looking for ways to improve and expand the agricultural sector. His experience has helped to bring excellent organisation to multiple operations - allowing the agricultural team to run like a well oiled machine. Stephen joined the business in January of 2016 to complement the existing labour force with the extra work involved with groundworks and land drainage. Stephen operates the gravel cart and provides both relief operation as well as back up during fertiliser applications. During harvest Stephen is a key member of the harvest team ensuring that the harvesting process and grain storage run as smoothly as possible. Stephen has since progressed to become the sole drill operator ensuring all crops are established successfully. Simon oversees both the agricultural and commercial side of the business. Working closely with John Haynes, farm manager - attention to detail is one of the main focus points. Having gained experience of over three decades of agriculture, the advice from Simon during challenging periods is hugely important. Simon has an active and dynamic approach to agriculture and has benefited from seeing several cycles within the industry. Providing help from the office including cropping decisions and variety choices, to getting 'hands on' during busy harvest periods - Simon is still very much an active partner in the business. Jed first completed a harvest role with MJ & SC Collins. Having fitted in with the rest of the agricultural team well, Jed returned 18 months later in the spring of 2018 to become a full time member of the agricultural side of the business. During harvest, Jed assists James to ensure that the harvest operation runs as smoothly as possible. Outside of harvest, Jed supports all other areas of the farm, including the contract drainage works. Pete, similar to Simon - has an involvement on both the commercial and agricultural side of the business. 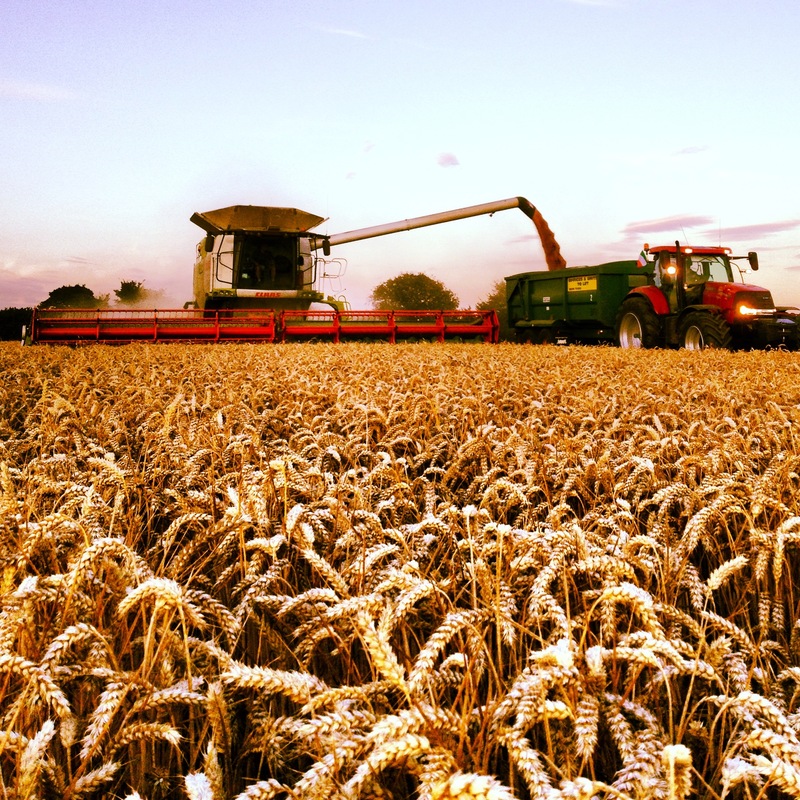 Having completed 8 seasons operating a Claas Lexion in the UK and a John Deere machine in Australia, harvest experience is helpful come the summer time. Pete also works very closely with John Haynes, farm manager to market all 18,000T of produce. Pete has introduced various instruments used to protect the businesses bottom line when it comes to marketing. The introduction of options, futures and hedging currency helps to run the business as efficiently as possible. James joined the team full time in March 2018. He has vast amounts of arable farming experience and provides vital backup to the farm manager John. James is the main operator of the Claas Lexion 770TT combine harvester and Agrifac Endurance crop sprayer. He also takes control of the part time labour force that is present during harvest to help reduce the workload on John. James is another key cog in the mechanism to make all operations run as smoothly as possible, both out on the farm and within the workshop. MJ & SC Collins works closely with various universities to provide placement opportunities for agriculturally based degrees. We currently offer a 12+ month placement, in which extensive experience and training will be gained. We also have part time opportunities to help cover extremely busy periods. During the summer months, it is not uncommon for 2 or 3 part time students to have roles spanning anywhere from 3 to 6 months.